In the last number of years, store blogging and vlogging have become two of the most popular channels of social media out there. Everyone and their dog has their own blog nowadays, here and while most are content to write content purely for their own sake and for that of their audience, others have become renowned for their quality of content, relatable style and creative flair. 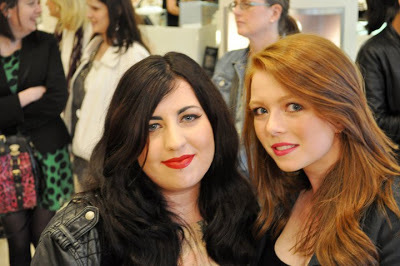 One such blog has been grown on home soil, by two beauty-mad ladies from Dublin. Viva Adonis is the creation of lifelong friends Dee and Sinéad; two girls for whom beauty and fashion are more than a mild interest, but a source of fascination and inspiration. Viva Adonis was created in 2010, and has since built a reputation for honest, knowledgeable beauty-related content. Constantly active on Twitter, Facebook and Pinterest, the girls behind Viva Adonis are at the forefront of what’s new in beauty in Ireland and beyond. However, with a loyal fanbase comes expectation, and sometimes it can be difficult to keep pace with the rapidly expanding beauty blogger market. Sinéad, speaking to The Trib, told us that, even in times where motivation is running a little low, ‘What motivates us to get back in the blogging saddle again ranges from other bloggers doing great, exciting things to new products. We are lucky to be sent a lot of stuff to try and it can be something as simple as a new lipstick formula or finding a cheaper alternative to an expensive product that will spawn a whole new wave of creativity’. What sets Viva Adonis apart from other bloggers is their honest, to-the-point reviews. This is certainly a breath of fresh air, when sometimes it can be tough to separate the genuine from the anodyne. So often now, particularly in the UK, blogging has become usurped by PR companies vying to have their clients presented in glowing light by the bloggers they engage. While this isn’t harmful itself, it can make for repetitive reading. But in Ireland, we haven’t reached saturation point quite yet. As Sinéad states, ‘The Irish blogging scene is still very much in its infancy but, it’s got the potential to skyrocket if we nurture it correctly. Oftentimes we compare ourselves to the UK where blogging is a very real, viable career for a huge number of people. Ireland isn’t quite there yet; as bloggers we are still walking the fine line between casual pastime and potential career, unsure of where we fit in, and those we deal with – PRs, brands and mainstream media, aren’t sure whether to treat us as professionals or hobbyists. It’s a learning curve for everyone involved but, there is no denying that the Irish blogging scene as a whole has a lot of influence over reader opinions and, at least in the case of beauty blogging, their spending habits which, in turn, is hugely valuable to the brands and businesses that have integrated themselves into the online community’. It is definitely true that beauty blogs have become a fantastic source of information for potential customers, and a trustworthy authority on a €40 foundation or a €30 lipstick can really help consumers avoid costly mistakes and invest in quality products. Of course, anyone can write an honest review about moisturiser, but that in itself does not a successful beauty blog make. Sinéad is keenly aware that it takes more to build and maintain a loyal following; ‘We find that changing things up a bit on the blog; a new design, a different style of post, can reinvigorate both ourselves and our readership. We recently incorporated some personal, lifestyle – type posts into our content and that has been getting a great response’. She also stressed the importance of spelling, grammar and quality photography in drawing a reader in. And of course, in a hobby/career area where there are plenty of worthy contenders, the importance of originality is paramount: ‘ I think finding your niche and becoming known for something helps in terms of building and maintaining a relationship – we are known for writing very in-depth, brutally honest reviews’. And lastly, staying active on social media is ‘an absolute’ if you want to keep pushing your blog forward and expand readership. The ladies behind Viva Adonis are living proof that Irish beauty and fashion bloggers have a lot to offer to their readers, current and potential. They belong to a talented, innovative bunch, and if you have more than a passing interest in beauty, then keeping up with Viva Adonis isn’t the worst thing you could do. Except, perhaps, to your purse. Check out Viva Adonis over here!